It was the hottest hour, of the hottest day, of what the people of Florence labelled the hottest summer of the decade. As we climb the numerous steps leading to Piazzale Michelangelo, we stop to catch our breath: exhausted, we take a look at the first glimpse of Florence appearing below us and start our ascent again, the end of the steps now tantalisingly close. You might wonder why a family with two children under five and an overloaded buggy would decide to climb a hill at such an uncomfortable time, but we had a good reason: at the top of the hill, there was a red, shiny, new Ferrari waiting for us. We do not own a Ferrari, just in case you are wondering; on that day, however, we had booked a tour that promised to give us the thrill of driving such a beautiful and iconic car. The company ‘Firenze in Ferrari / Test Drive Firenze‘ specialises in this kind of luxury Ferrari experience in Florence: if you are a car lover and have a clean driving licence, you can arrange to borrow, or I should say rent, one of their Ferrari and bring it for a drive around the Florentine hills. We had found this company on the web and decided to book a tour with them as a present to my brother in law, who was vacationing with us. 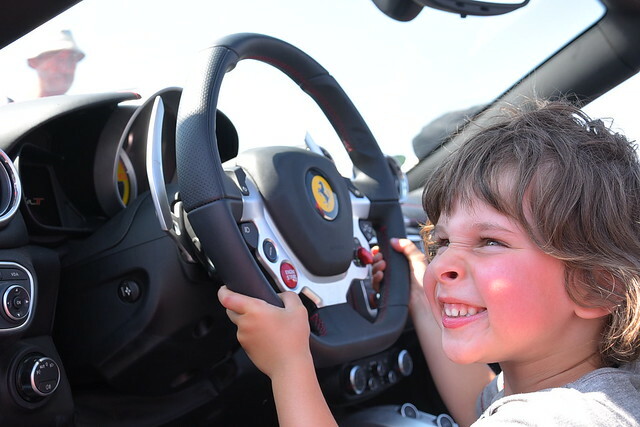 He loves cars and we were sure he would cherish the experience, but our decision about this present wasn’t entirely selfless: we were hoping that we would be able to sneak beside the Ferrari and come home with a fabulous picture of us beside the amazing machine! I am not a car lover, but I guess my vanity really took over in this case: I loved the idea of having a photo posing beside such a car, looking effortlessly elegant, and even toyed with the idea of posting it on facebook. There you go, I just admitted it: all my environmental concerns and attempt at being mature and immune to the superficial temptations of luxury life failed in front of that kind of bling. I wanted that photo! When we got to Piazzale Michelangelo, looking all but effortlessly elegant after the ascent, we immediately spotted the car. 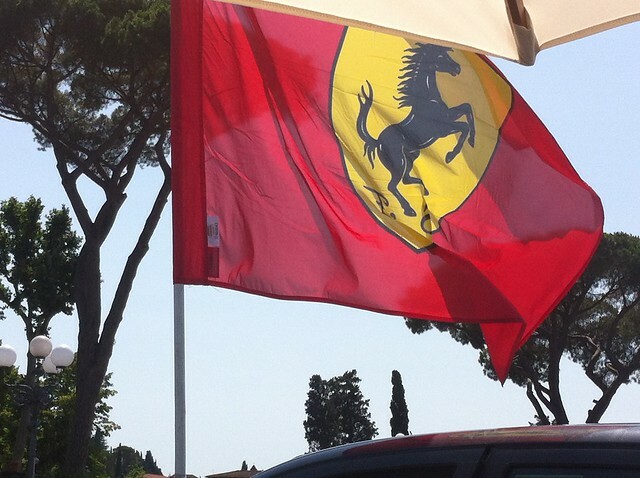 A Ferrari flag was flying in the breeze and the car was impossible to miss: her red paint was literally shining in the sun but what really made it stand out was the crowd of curious eyes around it. Piazzale Michelangelo is a huge tourist attraction in Florence: buses of tourists arrive here all day long, to see the beautiful view over the city, but the presence of the Ferrari had caught everyone’s attention. It was honestly funny to watch: unless you have booked the Ferrari experience, you are not allowed to take pictures beside the car (this is to make the experience of the people who did pay is more special and unique) and so the crowds, in awe, had created almost an amphitheater around the car: everybody wanted to see it! A little conscious of all the stares, we introduced ourselves to the Firenze in Ferrari people and soon our experience began. 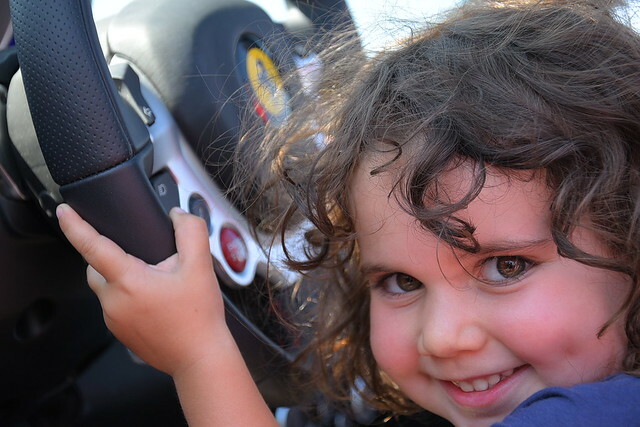 The lucky driver was my brother in law and we had presumed he would be the only one allowed in the car, but the people from Firenze in Ferrari were truly friendly and made sure we all got a piece of the action, even the kids! The eight of us were offered to sit, one by one in the car and to be photographed by their professional photographer. The kids were allowed in and came back with the best photos of all: have a look! The rabbit at her Ferrari experience in Florence! The Bear, in love with cars and vehicles in general, getting a taste of what he is sure will be his usual car when older! After we all took our turn, my brother in law was on his way and his wife was offered the seat behind: the passenger seat is reserved for the company staff, who does accompany you during the drives. We had offered to take the children and so, after listening to the roar of the engine, headed for the shade in the nearby cafe. While we played puzzles, the tour brought them around the Florentine hills and soon back to Piazzale Michelangelo, where they returned the car and collected the memory stick containing the many photos the day and a video of the drive, taken by a video camera mounted at the back of the car. It was a wonderful day and they came back saying they truly enjoyed the experience. I personally did as well and the kids adored being involved in the photos. My only regret is not having messed around to get a decent picture of me: such a car required some self-irony and posing, I believe, but I got too self-conscious!! Oh well, I guess it means I need to book one more tour next time I am in Florence to make up for this! Me in the Ferrari. the car makes up for the boring pose! What do you think: is a tour like this be something you might enjoy?